CarGurus has 7,273 nationwide Sonic listings starting at $999. The zippy little Chevrolet Sonic subcompact has made quite a splash since its debut in 2012, thanks to its attention-grabbing exterior design, roomy interior, agile handling and available turbocharged powerplant. 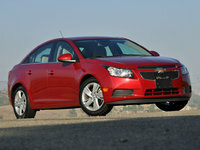 It's also one of the safest cars in its class, with 10 airbags among its standard features. For 2014, Chevy makes the Sonic even safer by adding a number of new standard and optional features, including a standard rear-view camera on high-end trims and a new available safety package, which adds a couple of cutting-edge crash-avoidance systems. In addition, the automaker offers the Sonic in new Red Hot, Cool Blue and Ashen Gray Metallic exterior colors for 2014. When the Sonic replaced the unexciting Aero in 2012, it was Chevy's answer to sporty subcompact imports like the the Nissan Versa, Kia Rio, Volkswagen Golf, Mazda3, Honda Fit and Hyundai's Accent and Elantra, as well as domestic subcompacts like the Ford Fiesta. The Sonic had to excel coming out of the gate to hold its ground in this very competitive class, and so far it has done just that, garnering good reviews and selling well. In fact, for several months in early 2013, the Sonic was the top-selling subcompact in the U.S., beating out rivals like the Versa, Fiesta, Accent and Rio, attesting to its popularity. The Sonic offers plenty of interior and cargo space, although it doesn't quite match vehicles like the Accent when it comes to standard tech features. Chevy still doesn't offer an available navigation system on the Sonic, for instance. However, numerous reviewers have encouraged prospective buyers to take a look at the Sonic, and current owners are generally pleased with their purchases, although some say they aren't getting promised fuel economy numbers from their vehicles. The Chevy Sonic continues to come in 4-door sedan and 5-door hatchback body styles in base LS, mid-range LT and top-of-the-line LTZ trims, as well as in a sport-oriented RS hatchback trim, which debuted in 2013. For 2014, the LTZ and RS trims get a new rear-view camera as standard equipment. A new Advanced Safety Package for all trims adds forward collision alert and lane-departure warning crash-avoidance systems to the list of available safety features. In addition, Chevy introduces a new available LT Promotional Package for 2014, which includes front foglights, a power sunroof and the automaker's MyLink system. Geared toward younger buyers and small families with limited budgets, the Sonic displays a fluid, contemporary exterior design with an aggressive dual-element grille fronting a somewhat blunt nose, dressed up with a sculpted hood and motorcycle-inspired automatic on/off halogen headlights. A sharply raked windshield, prominent fender flares, low roofline, rising sidelines and round taillights complete the exterior design. In addition, Chevy pushes the wheels out to the far corners, which gives the Sonic a solid, planted look, and helps to improve stability and handling. Daytime running lights are standard across the line, while the LT and LTZ add heated side mirrors. The LTZ also comes equipped with chrome trim, front foglights and a rear spoiler. The RS, available only as a hatchback, shows off a unique exterior design, starting up front with a sportier fascia featuring a deep air dam, vertical intakes and foglights. Rocker moldings, a rear spoiler and a bright exhaust outlet, as well as a lowered suspension, also help to distinguish the RS from the rest of the pack. As in previous years, a cadre of two engines and three transmissions drive the various Sonic trims. Base power for all except the RS comes from a 1.8-liter Ecotec 4-cylinder engine, which delivers 138 hp and 125 lb-ft of torque. It mates to either a 5-speed manual transmission or an available 6-speed automatic. Fuel economy numbers check in at 26 mpg city/35 highway with either transmission. A turbocharged 1.4-liter Ecotec 4-cylinder engine, available in the LS and LTZ, puts out the same horsepower but boosts torque to 148 over a wide rpm range, resulting in quicker acceleration and a sportier ride. It's paired with either an upgraded 6-speed manual shifter or an upgraded 6-speed automatic. The turbocharged engine comes standard in the RS. Fuel-economy numbers for the turbo engine climb to 29/40 with the manual shifter and 27/37 with the automatic. The front-wheel-drive Sonic gets strong praise for its ride and handling, thanks in part to its sporty suspension, designed by the Corvette's engineering team. The stiff body structure provides a firm, precise feel and minimizes noise and vibration. The MacPherson front suspension and torsion-beam link-type configuration in the rear remain unchanged for 2014. The RS rides on a lowered and stiffened suspension with performance-tuned dampers. The LS and LT continue to receive 15-inch aluminum wheels, while the LTZ and RS both get 17-inch aluminum wheels. Reviewers and owners alike are surprised by the amount of interior and cargo space offered by the Sonic. Passengers will find plenty of legroom in both the front and rear seats, although there's more second-row headroom in hatchbacks due to their boxier profile. The seats are comfortable and supportive, with cloth upholstery in the LS and LT, while the LTZ upgrades to perforated leatherette seating surfaces and heated front seats. The rear seatback splits 60/40 and folds flat to provide cargo-carrying flexibility. With the rear seats up, the sedan offers 14.9 cubic feet of cargo space in the trunk, while the hatchback offers 19 cubic feet. That expands to 47.7 cubic feet in hatchbacks with the rear seatbacks folded down. Although the Sonic doesn't come as well-equipped as some of its competitors, it still includes standard features like air conditioning, remote keyless entry, a tilt/telescopic steering wheel and a 4-speaker audio system with Bluetooth and an auxiliary input jack, as well as OnStar with turn-by-turn navigation and vehicle diagnostics. The LT adds power windows, cruise control and an upgraded 6-speaker audio system with a CD player and SiriusXM satellite radio, while the LTZ rounds out the standard feature list with a leather-wrapped steering wheel, cruise control, remote start and an upgraded audio system with a USB port and steering-wheel-mounted audio controls. Owners can add an optional power sunroof to the LTZ. In addition, Chevy's MyLink infotainment system, which comes standard in the LTZ and RS, includes a 7-inch color screen, Bluetooth streaming audio and apps for Pandora and other mobile services. The Sonic was named a Top Safety Pick by the IIHS for 2013, and that should continue forward into 2014. Equipped with 10 standard airbags, including front knee and side-impact airbags, the Sonic remains one of the safest vehicles in its class. The StabiliTrak electronic stability control system, traction control, hill start assist and 4-wheel antilock brakes with brake assist and electronic brakeforce distribution also come standard on all Sonics. 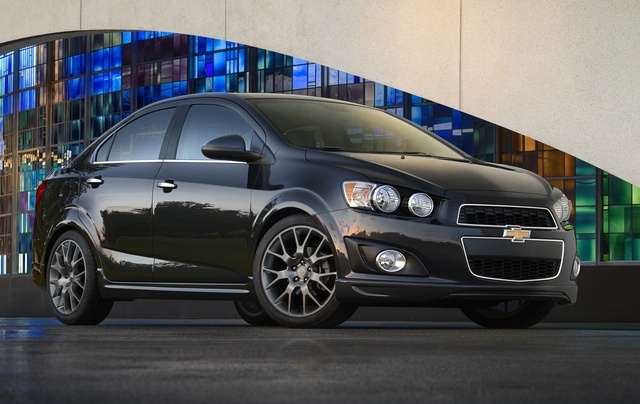 What's your take on the 2014 Chevrolet Sonic? Users ranked 2014 Chevrolet Sonic against other cars which they drove/owned. Each ranking was based on 9 categories. Here is the summary of top rankings. Have you driven a 2014 Chevrolet Sonic? 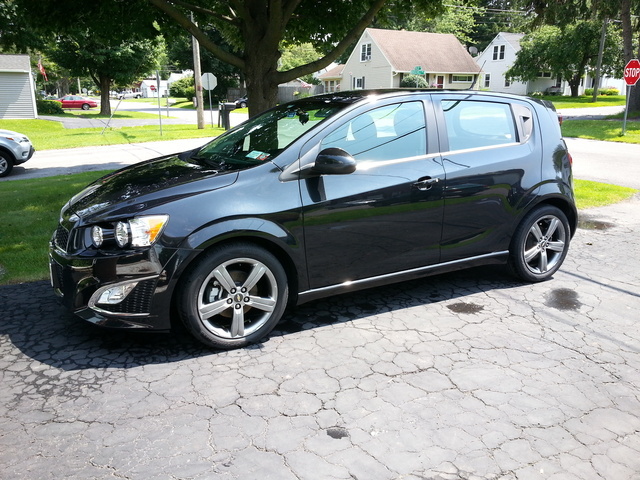 What is the best recommended fuel additives and fuel for my 2014 chevy sonic turbo? Why Doesn't The Heater Warm Up Unless Car Is In Motion?